A team of eight people from Nepal supported by ICIMOD’s Himalica programme and HICAP visited Haryana and Delhi in India from 5-10 December 2016 under the coordination of CIMMYT-India to learn about climate-smart agricultural practices as well as marketing aspects of vegetable value chains. The team visited the Central Soil Salinity Research Institute (CSSRI) in Haryana to learn about climate smart agriculture. CSSRI conducts research on the design, application and impact of agricultural technologies and practices that are water smart, weather smart, carbon smart, nutrient smart, energy smart, and knowledge smart, apart from providing technical support to farmers as and when needed. It also promotes zero tillage and residue management to reduce the cost of production and increase yields. It encourages the planting of rice followed by wheat, or rice followed by maize to take advantage of nutrient recycling, and agricultural technologies such as turbo seeder (a complete solution for agriculture), GreenSeeker (for gauging the nutrient requirements of crops), and a hydraulically-operated laser-based land leveler. 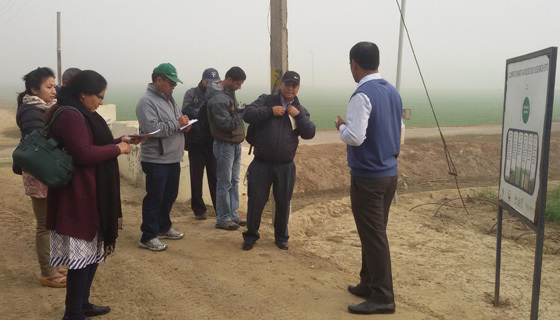 CSSRI manages demo farms for promoting its climate smart agricultural practices and technologies in different villages of Haryana such as Gir, Chaurpura and Kalasaura and Uchama Samana Gaon, some of which the team visited. Clearly impressed by the various technologies tested and promoted by CSSRI, Min Prasad Budhathoki of the Ministry of Agriculture Development, Nepal, said, "These technologies, and zero tillage can be very beneficial to Nepal if widely diffused and replicated on the ground." The team next visited Dristhee, an NGO based in Noida, to learn about various aspects of the marketing of agricultural products, mainly vegetables, under a 4 Cs approach: community, capacity, capital, and channel. Marketing experts at Dristhee explained the two innovative agriculture marketing programmes they run called Madhukrishi and Sajhi Tokari, the overall objective of which is to connect producers directly with consumers, cutting out the middlemen, thereby maximizing the benefits accrued to both the farmers and buyers. Their marketing approach of connecting production directly with marketing gives leverage to producers and consumers. It is also socially responsible, and transparent about benefit sharing. The team on the exposure visit comprised of delegates from the Ministry of Agricultural Development (MoAD), the District Agriculture Development Offices (DADOs) of Udayapur and Kavrepalanchowk districts, Himalica partners, and two staff from ICIMOD acting as facilitators. Min Prasad Budhathoki, Agriculture Information and Communication Centre Chief, MOAD; Bidhya Pandey, Environmental Chief, MOAD; Saroj Kanta Adhikari, DADO-Udaypur; Durga Prasad Pandit, DADO-Kavre; and Roshan Subedi and Shyam Krishna Ghimire from the Centre for Environmental and Agricultural Policy Research, Extension and Development (CEAPRED) were amongst the delegates. 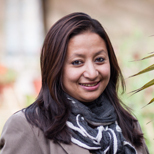 Anu Joshi Shrestha and Madhav Dhakal from ICIMOD facilitated the exposure visit. It is hoped that the policymakers from Nepal who benefited from the exposure trip will lobby the Nepali government to support its farmers’ transition from traditional to climate smart agriculture. Likewise, the various officers affiliated with DADOs will do their bit to promote technologies such as the GreenSeeker, turbo seeder, and radar-based land leveler in their respective districts, as well as good practices such as zero tillage and residue management.